As the journal is becoming more specialized with a focus on research notes, we wanted to open it up to research outputs from all scientific and clinical disciplines. We are delighted to expand our scope to also welcome submissions on physical and computer sciences, engineering and mathematics. An Editorial has been published describing the new scope and direction of BMC Research Notes. B. Seiger Cronfalk, A. Fjell, N. Carstens, et al. The aim was to describe the development, utilization and feasibility of a model of preventive home visits, in an urban and a rural municipality in Norway. BACKGROUND: Older people >65 years will rise significantly in coming years. Increased age is associated with risk of disability, illness and need for public health services. Preventive home visits is assumed to help older people to maintain their functional level longer, delaying disease and thus delaying the need for health care. METHOD: Descriptive explorative design describing the development, utilization and feasibility of preventive home visits in two different settings. All 77-year-old persons living at home in an urban municipality and all 75 years and older in a rural municipality were invited to participate. A questionnaire including a substantial number of tests concerning; fall, nutrition, polypharmacy and cognitive impairment was used by Health Team Nurses as base for a risk assessment. Pilot studies were conducted to validate the questionnaire including an inter-rater reliability study of the risk assessment tool. A multiprofessional team, Health Team for the Elderly met each week to evaluate risk assessments and make recommendations to be sent to each respective general practitioner. Data were analysed using descriptive and inferential statistics. In total, 167 persons (109 from the urban municipality and 58 from the rural municipality) participated, corresponding to 60% of the approached individuals. The mean time for the visits was 108 minutes (SD 20). Missing data were identified for; Do you feel safe in your municipality (17.5%) and Are you looking forward to ageing (11.4%). In total, 36 persons (21.7%) were identified with increased risk for developing illness. We suggest that a structured model of preventive home visits and collaboration between highly specialized health care professionals are important factors for reliable health promoting risk assessments of elderly home dwellers. We invite you to join the discussion on KT in Primary Care through attendance at the KT Canada Annual Scientific Meeting. We invite interested people to submit an abstract on any topic related to advancing KT science. B. Skela-Savic, S. Hvalic-Touzery and K. Pesjak. AIM: To establish the connection between values, competencies, selected job characteristics and evidence-based practice use. BACKGROUND: Nurses rarely apply evidence-based practice in everyday work. A recent body of research has looked at various variables explaining the use of evidence-based practice, but not values and competencies. DESIGN: A cross-sectional, non-experimental quantitative explorative research design. METHODS: Standardized instruments were used (Nurse Professional Values Scale-R, Nurse Competence Scale, Evidence-Based Practice Beliefs and Implementation Scale). The sample included 780 nurses from 20 Slovenian hospitals. The data were collected in 2015. RESULTS: Study identifies two new variables contributing to a better understanding of beliefs on and implementation of evidence-based practice, thus broadening the existing research evidence. These are the values of activism and professionalism and competencies aimed at the development and professionalization of nursing. Values of caring, trust and justice and competencies expected in everyday practice do not influence the beliefs and implementation of evidence-based practice. Respondents ascribed less importance to values connected with activism and professionalism and competencies connected with the development of professionalism. Nurses agree that evidence-based practice is useful in their clinical work, but they lack the knowledge to implement it in practice. Evidence-based practice implementation in nursing practice is low. CONCLUSIONS: Study results stress the importance of increasing the knowledge and skills on professional values of activism and professionalism and competencies connected to nursing development. The study expands the current understanding of evidence-based practice use and provides invaluable insight for nursing managers, higher education managers and the national nursing association. R. J. Chan, A. Bowers and M. Barton-Burke. The ever-increasing cancer care demand has posed a challenge for oncology nurses to deliver evidence-based, innovative care. Despite efforts to promote evidence-based practice, barriers remain and executives find it difficult to implement evidence-based practice efficiently. Using the successful experience of an Australian tertiary cancer center, this paper depicts 4 effective strategies for facilitating evidence-based practice at the organizational level-the Embedded Scholar: Enabler, Enactor, and Engagement (4 Es) Model-includes a 12-week evidence-based practice program that prioritizes relevant research proposed by clinical staff and endorses high-quality, evidence-based point-of-care resources. G. Overbeck, A. S. Davidsen and M. B. Kousgaard. BACKGROUND: Collaborative care is an increasingly popular approach for improving quality of care for people with mental health problems through an intensified and structured collaboration between primary care providers and health professionals with specialized psychiatric expertise. Trials have shown significant positive effects for patients suffering from depression, but since collaborative care is a complex intervention, it is important to understand the factors which affect its implementation. We present a qualitative systematic review of the enablers and barriers to implementing collaborative care for patients with anxiety and depression. METHODS: We developed a comprehensive search strategy in cooperation with a research librarian and performed a search in five databases (EMBASE, PubMed, PsycINFO, ProQuest, and CINAHL). All authors independently screened titles and abstracts and reviewed full-text articles. Studies were included if they were published in English and based on the original qualitative data on the implementation of a collaborative care intervention targeted at depression or anxiety in an adult patient population in a high-income country. Our subsequent analysis employed the normalization process theory (NPT). RESULTS: We included 17 studies in our review of which 11 were conducted in the USA, five in the UK, and one in Canada. We identified several barriers and enablers within the four major analytical dimensions of NPT. Securing buy-in among primary care providers was found to be critical but sometimes difficult. Enablers included physician champions, reimbursement for extra work, and feedback on the effectiveness of collaborative care. The social and professional skills of the care managers seemed critical for integrating collaborative care in the primary health care clinic. Day-to-day implementation was also found to be facilitated by the care managers being located in the clinic since this supports regular face-to-face interactions between physicians and care managers. CONCLUSIONS: The following areas require special attention when planning collaborative care interventions: effective educational programs, especially for care managers; issues of reimbursement in relation to primary care providers; good systems for communication and monitoring; and promoting face-to-face interaction between care managers and physicians, preferably through co-location. There is a need for well-sampled, in-depth qualitative studies on the implementation of collaborative care in settings outside the USA and the UK. R. E. Keith, J. C. Crosson, A. S. O’Malley, D. Cromp and E. F. Taylor. BACKGROUND: Much research does not address the practical needs of stakeholders responsible for introducing health care delivery interventions into organizations working to achieve better outcomes. In this article, we present an approach to using the Consolidated Framework for Implementation Research (CFIR) to guide systematic research that supports rapid-cycle evaluation of the implementation of health care delivery interventions and produces actionable evaluation findings intended to improve implementation in a timely manner. METHODS: To present our approach, we describe a formative cross-case qualitative investigation of 21 primary care practices participating in the Comprehensive Primary Care (CPC) initiative, a multi-payer supported primary care practice transformation intervention led by the Centers for Medicare and Medicaid Services. Qualitative data include observational field notes and semi-structured interviews with primary care practice leadership, clinicians, and administrative and medical support staff. We use intervention-specific codes, and CFIR constructs to reduce and organize the data to support cross-case analysis of patterns of barriers and facilitators relating to different CPC components. RESULTS: Using the CFIR to guide data collection, coding, analysis, and reporting of findings supported a systematic, comprehensive, and timely understanding of barriers and facilitators to practice transformation. Our approach to using the CFIR produced actionable findings for improving implementation effectiveness during this initiative and for identifying improvements to implementation strategies for future practice transformation efforts. CONCLUSIONS: The CFIR is a useful tool for guiding rapid-cycle evaluation of the implementation of practice transformation initiatives. Using the approach described here, we systematically identified where adjustments and refinements to the intervention could be made in the second year of the 4-year intervention. We think the approach we describe has broad application and encourage others to use the CFIR, along with intervention-specific codes, to guide the efficient and rigorous analysis of rich qualitative data. TRIAL REGISTRATION: NCT02318108. L. E. Nordstrum, P. G. LeMahieu and E. Berrena. Purpose: This paper is one of seven in this volume elaborating upon different approaches to quality improvement in education. This paper aims to delineate a methodology called Implementation Science, focusing on methods to enhance the reach, adoption, use and maintenance of innovations and discoveries in diverse education contexts. Design/methodology/approach: The paper presents the origins, theoretical foundations, core principles and a case study showing an application of Implementation Science in education, namely, in promoting school–community–university partnerships to enhance resilience (PROSPER). Findings: Implementation Science is concerned with understanding and finding solutions to the causes of variation in a program’s outcomes relating to its implementation. The core phases are: initial considerations about the host context; creating an implementation structure; sustaining the structure during implementation; and improving future applications. Originality/value: Few theoretical treatments and demonstration cases are currently available on commonly used models of quality improvement in other fields that might have potential value in improving education systems internationally. This paper fills this gap by elucidating one promising approach. The paper also derives value, as it permits a comparison of the Implementation Science approach with other quality improvement approaches treated in this volume. R. G. Tabak, M. M. Padek, J. F. Kerner, et al. INTRODUCTION: Dissemination and implementation research training has great potential to improve the impact and reach of health-related research; however, research training needs from the end user perspective are unknown. This paper identifies and prioritizes dissemination and implementation research training needs. METHODS: A diverse sample of researchers, practitioners, and policymakers was invited to participate in Concept Mapping in 2014-2015. Phase 1 (Brainstorming) gathered participants’ responses to the prompt: To improve the impact of research evidence in practice and policy settings, a skill in which researchers need more training is… The resulting statement list was edited and included subsequent phases. Phase 2 (Sorting) asked participants to sort each statement into conceptual piles. In Phase 3 (Rating), participants rated the difficulty and importance of incorporating each statement into a training curriculum. A multidisciplinary team synthesized and interpreted the results in 2015-2016. RESULTS: During Brainstorming, 60 researchers and 60 practitioners/policymakers contributed 274 unique statements. Twenty-nine researchers and 16 practitioners completed sorting and rating. Nine concept clusters were identified: Communicating Research Findings, Improve Practice Partnerships, Make Research More Relevant, Strengthen Communication Skills, Develop Research Methods and Measures, Consider and Enhance Fit, Build Capacity for Research, and Understand Multilevel Context. Though researchers and practitioners had high agreement about importance (r =0.93) and difficulty (r =0.80), ratings differed for several clusters (e.g., Build Capacity for Research). CONCLUSIONS: Including researcher and practitioner perspectives in competency development for dissemination and implementation research identifies skills and capacities needed to conduct and communicate contextualized, meaningful, and relevant research. L. M. Pfadenhauer, A. Gerhardus, K. Mozygemba, et al. BACKGROUND: The effectiveness of complex interventions, as well as their success in reaching relevant populations, is critically influenced by their implementation in a given context. Current conceptual frameworks often fail to address context and implementation in an integrated way and, where addressed, they tend to focus on organisational context and are mostly concerned with specific health fields. Our objective was to develop a framework to facilitate the structured and comprehensive conceptualisation and assessment of context and implementation of complex interventions. METHODS: The Context and Implementation of Complex Interventions (CICI) framework was developed in an iterative manner and underwent extensive application. An initial framework based on a scoping review was tested in rapid assessments, revealing inconsistencies with respect to the underlying concepts. Thus, pragmatic utility concept analysis was undertaken to advance the concepts of context and implementation. Based on these findings, the framework was revised and applied in several systematic reviews, one health technology assessment (HTA) and one applicability assessment of very different complex interventions. Lessons learnt from these applications and from peer review were incorporated, resulting in the CICI framework. RESULTS: The CICI framework comprises three dimensions-context, implementation and setting-which interact with one another and with the intervention dimension. Context comprises seven domains (i.e., geographical, epidemiological, socio-cultural, socio-economic, ethical, legal, political); implementation consists of five domains (i.e., implementation theory, process, strategies, agents and outcomes); setting refers to the specific physical location, in which the intervention is put into practise. The intervention and the way it is implemented in a given setting and context can occur on a micro, meso and macro level. Tools to operationalise the framework comprise a checklist, data extraction tools for qualitative and quantitative reviews and a consultation guide for applicability assessments. CONCLUSIONS: The CICI framework addresses and graphically presents context, implementation and setting in an integrated way. It aims at simplifying and structuring complexity in order to advance our understanding of whether and how interventions work. The framework can be applied in systematic reviews and HTA as well as primary research and facilitate communication among teams of researchers and with various stakeholders. Bethany R. Lee and J. C. McMillen. J EMOTIONAL BEHAV DISORD 2017 03;25(1):19-27. Evidence-based practices are often discussed but less easily implemented. Almost all the existing manualized, diagnostic-specific evidence-based practices were neither designed for nor tested in residential programs. However, a recent survey of group care providers found great interest and some success in infusing evidence-based programs and practices in serving youth. This article described four possible pathways for group care programs to pursue to advance the use of evidence-based practices and programs. These examples include using the common elements approach, building a home-grown program and its evidence, adapting an existing manualized practice for a group care setting, and adapting a residential program to incorporate an evidence-based practice. An extended case study is provided to illustrate the process and potential challenges of creating an intervention and testing it in a group care setting. A. E. Kris, L. A. Henkel, K. M. Krauss and S. C. Birney. The purpose of the current study was to understand (a) the extent to which reminiscence is used among nursing home staff (RNs, licensed practical nurses, and certified nursing assistants), (b) the reasons nursing home staff engage in reminiscence activities with nursing home residents, and (c) the value they attribute to these activities. The degree to which engagement in reminiscence activities by nursing staff contributed to knowledge about residents was also explored. The most frequently used functions of reminiscence, as reported by nursing staff, were to calm anxiety, help residents see meaning in life, and reorient confused residents. Although nursing caregivers (N = 43) found reminiscence activities moderately to very enjoyable (76.5%), less than one half (46.5%) reported engaging in reminiscence activities with residents frequently or very frequently. Nurses who engaged in reminiscence activities more often also reported knowing residents better-a hallmark of high-quality care for residents with dementia. A. G. Mamhidir, B. M. Sjolund, B. Flackman, A. Wimo, A. Skoldunger and M. Engstrom. BACKGROUND: Chronic pain affects nursing home residents’ daily life. Pain assessment is central to adequate pain management. The overall aim was to investigate effects of a pain management intervention on nursing homes residents and to describe staffs’ experiences of the intervention. METHODS: A cluster-randomized trial and a mixed-methods approach. Randomized nursing home assignment to intervention or comparison group. The intervention group after theoretical and practical training sessions, performed systematic pain assessments using predominately observational scales with external and internal facilitators supporting the implementation. No measures were taken in the comparison group; pain management continued as before, but after the study corresponding training was provided. Resident data were collected baseline and at two follow-ups using validated scales and record reviews. Nurse group interviews were carried out twice. Primary outcome measures were wellbeing and proxy-measured pain. Secondary outcome measures were ADL-dependency and pain documentation. RESULTS: Using both non-parametric statistics on residential level and generalized estimating equation (GEE) models to take clustering effects into account, the results revealed non-significant interaction effects for the primary outcome measures, while for ADL-dependency using Katz-ADL there was a significant interaction effect. Comparison group (n = 66 residents) Katz-ADL values showed increased dependency over time, while the intervention group demonstrated no significant change over time (n = 98). In the intervention group, 13/44 residents showed decreased pain scores over the period, 14/44 had no pain score changes >/= 30% in either direction measured with Doloplus-2. Furthermore, 17/44 residents showed increased pain scores >/= 30% over time, indicating pain/risk for pain; 8 identified at the first assessment and 9 were new, i.e. developed pain over time. No significant changes in the use of drugs was found in any of the groups. Nursing pain related documentation was sparse. In general, nurses from the outset were positive regarding pain assessments. Persisting positive attitudes seemed strengthened by continued assessment experiences and perceptions of improved pain management. CONCLUSION: The implementation of a systematic work approach to pain issues in nursing homes indicates that an increased awareness, collaboration across and shared understanding among the team members of the pain assessment results can improve pain management and lead to decreased physical deterioration or the maintenance of physical and functional abilities among NH residents. However, pain (proxy-measured) and wellbeing level did not reveal any interaction effects between the groups over time. T. Lung, K. Howard, C. Etherton-Beer, M. Sim, G. Lewin and G. Arendts. BACKGROUND: Accurately assessing changes in the quality of life of older people living permanently in nursing homes is important. The multi-attribute utility instrument most commonly used and recommended to assess health-related quality of life in the nursing home population is the three-level EuroQol EQ-5D-3L. To date, there have been no studies using the Health Utilities Index Mark III (HUI3). The purpose of this study was to compare the level of agreement and sensitivity to change of the EQ-5D-3L and HUI3 in a nursing home population. METHODS: EQ-5D-3L and HUI3 scores were measured as part of a cluster randomised controlled trial of nurse led care coordination in a nursing home population in Perth, Western Australia at baseline and 6-month follow up. RESULTS: Both measures were completed for 199 residents at baseline and 177 at 6-month follow-up. Mean baseline utility scores for EQ-5D-3L (0.45; 95% CI 0.41-0.49) and HUI3 (0.15; 95% CI 0.10-0.20) were significantly different (Wilcoxon signed rank test, p<0.01) and agreement was poor to moderate between absolute scores from each instrument (intra-class correlation coefficient = 0.63). The EQ-5D-3L appeared more sensitive to change over the 6-month period. CONCLUSION: Our findings show that the EQ-5D-3L and HUI3 estimate different utility scores among nursing home residents. These differences should be taken into account, particularly when considering the implications of the cost-effectiveness of particular interventions and we conclude that the HUI3 is no better suited to measuring health-related quality of life in a nursing home population when compared to the EQ-5D-3L. Are Hospital/ED Transfers Less Likely Among Nursing Home Residents With Do-Not-Hospitalize Orders? T. Nakashima, Y. Young and W. H. Hsu. OBJECTIVES: This study aims to examine whether an advance directive “Do Not Hospitalize” (DNH) would be effective in reducing hospital/emergency department (ED) transfers. Similar effects in residents with dementia were also examined. DESIGN: Cross-sectional study. SETTING/SUBJECTS: New York State (NYS) nursing home residents (n = 43,024). MEASUREMENTS AND ANALYSIS: The Minimum Data Set 2.0 was used to address the study aims. Advance directives with an indication of DNH and Alzheimer disease/dementia other than Alzheimer disease were coded (yes vs no). Logistic regression analyses were performed to quantify the relationship between DNH orders and hospital/ED transfers while adjusting for confounders. RESULTS: Our results show that 61% of nursing home residents had do-not-resuscitate orders, 12% had feeding restrictions, and only 6% had DNH orders. Residents with DNH orders had significantly fewer hospital stays (3.0% vs 6.8%, P <.0001) and ED visits (2.8% vs 3.6%, P = .03) in the last 90 days than those without DNH orders. Dementia residents with DNH orders had significantly fewer hospital stays (2.7% vs 6.3%, P < .0001) but not ED visits (2.8% vs 3.5%, P = .11) than those without DNH orders. After adjusting for covariates in the model, the results show that for residents without DNH orders, the odds of being transferred to a hospital was significantly higher (odds ratio = 2.23, 95% confidence interval = 1.77-2.81) than those with DNH orders. CONCLUSION: Residents with DNH orders had significantly fewer transfers. This suggests that residents’ end-of-life care decisions were respected and honored. Efforts should be made to encourage nursing home residents to complete DNH orders to promote integration of the resident’s values and goals in guiding care provision toward the end of life. S. Ono, M. Ishimaru, H. Yamana, et al. BACKGROUND AND OBJECTIVE: Although oral care may have salutary effects among frail elderly people, access to dental care is often limited in long-term care facilities. In 2009, the Japanese long-term care insurance system introduced an additional reimbursement scheme for enhanced oral care supervised by dentists in nursing facilities. The aim of this study was to examine whether enhanced oral care provided by trained nursing facility staff members is sufficient to improve health outcomes among nursing facility residents. DESIGN, SETTING, AND PARTICIPANTS: This was a quasi-experimental study using a nationwide long-term care database. Using facility-level propensity score matching, we identified 170,874 residents in 742 facilities that provided enhanced oral care and 167,546 residents in 742 control facilities that provided only standard care from 2009 to 2012. We used a resident-level difference-in-differences approach to analyze the impact of enhanced oral care on health outcomes among nursing facility residents. RESULTS: After controlling for resident characteristics and background time trends, no significant differences were found between residents admitted to the facilities with and without enhanced oral care in the incidence of critical illness, transfer to a hospital, mortality, or costs. Yearly change in the odds of discharge to home was significantly increased for residents with enhanced oral care (odds ratio = 1.07; 95% confidence interval: 1.02-1.12; P = .008). CONCLUSION: The results suggest that enhanced oral care provided by trained nursing facility staff members may improve the general condition of elderly residents in nursing facilities and promote their discharge to home. S. Bjork, M. Lindkvist, A. Wimo, C. Juthberg, A. Bergland and D. Edvardsson. AIM: To describe the prevalence of everyday activity engagement for older people in nursing homes and the extent to which engagement in everyday activities is associated with thriving. BACKGROUND: Research into residents’ engagement in everyday activities in nursing homes has focused primarily on associations with quality of life and prevention and management of neuropsychiatric symptoms. However, the mere absence of symptoms does not necessarily guarantee experiences of well-being. The concept of thriving encapsulates and explores experiences of well-being in relation to the place where a person lives. DESIGN: A cross-sectional survey. METHOD: A national survey of 172 Swedish nursing homes (2013-2014). Resident (n = 4831) symptoms, activities and thriving were assessed by staff using a study survey based on established questionnaires. Descriptive statistics, simple and multiple linear regression, and linear stepwise multiple regression were performed. RESULTS: The most commonly occurring everyday activities were receiving hugs and physical touch, talking to relatives/friends and receiving visitors, having conversation with staff not related to care and grooming. The least commonly occurring everyday activities were going to the cinema, participating in an educational program, visiting a restaurant and doing everyday chores. Positive associations were found between activity engagement and thriving, where engagement in an activity program, dressing nicely and spending time with someone the resident likes had the strongest positive association with resident thriving. CONCLUSIONS: Engagement in everyday activities can support personhood and thriving and can be conceptualized and implemented as nursing interventions to enable residents to thrive in nursing homes. B. Dewar and T. MacBride. Relationship-centred practice is key to delivering quality care in care homes. Evidence is strong about the centrality of human interaction in developing relationships that promote dignity and compassion. The Caring Conversations framework is a framework for delivering compassionate care based on human interactions that was developed in the acute healthcare setting. The key attributes are: be courageous, connect emotionally, be curious, consider other perspectives, collaborate, compromise and celebrate. This paper reports on a study to explore its relevance to the care home setting and the development of an educational intervention, based on the framework, to enhance development of human interaction. The study used the approach of appreciative inquiry to develop Caring Conversations in the care home setting. Appreciative inquiry has a unique focus on what is working well, understanding why these aspects work well and co-creating strategies to help these good practices happen more of the time. The aim of the study was to celebrate and develop excellent human interaction that promotes dignity between staff, residents and families in care homes. The study took place in 2013-2014 in one care home in Scotland, over 10 months. Participants included staff (n = 37), residents (n = 20) and relatives (n = 18). Data generation methods involving residents, relatives and staff included observation and interviews about experiences of interaction. An iterative process of data analysis involved mapping core themes to the Caring Conversations framework with findings showing how people communicated correlated well with the Caring Conversations framework. Building on knowledge of what works well, staff developed small ‘tests of change’ that enabled these good practices to happen more of the time. Appreciative inquiry proved a valuable approach to exploring Caring Conversations, developing practice and developing an educational intervention that could be shared across other care settings. J. Mowery, A. Andrei, E. Le, J. Jian and M. Ward. BACKGROUND: It is challenging to assess the quality of care and detect elder abuse in nursing homes, since patients may be incapable of reporting quality issues or abuse themselves, and resources for sending inspectors are limited. OBJECTIVE: This study correlates Google reviews of nursing homes with Centers for Medicare and Medicaid Services (CMS) inspection results in the Nursing Home Compare (NHC) data set, to quantify the extent to which the reviews reflect the quality of care and the presence of elder abuse. METHODS: A total of 16,160 reviews were collected, spanning 7,170 nursing homes. Two approaches were tested: using the average rating as an overall estimate of the quality of care at a nursing home, and using the average scores from a maximum entropy classifier trained to recognize indications of elder abuse. RESULTS: The classifier achieved an F-measure of 0.81, with precision 0.74 and recall 0.89. The correlation for the classifier is weak but statistically significant: = 0.13, P < .001, and 95% confidence interval (0.10, 0.16). The correlation for the ratings exhibits a slightly higher correlation: = 0.15, P < .001. Both the classifier and rating correlations approach approximately 0.65 when the effective average number of reviews per provider is increased by aggregating similar providers. CONCLUSIONS: These results indicate that an analysis of Google reviews of nursing homes can be used to detect indications of elder abuse with high precision and to assess the quality of care, but only when a sufficient number of reviews are available. B. Yeaman, K. J. Ko and R. Alvarez del Castillo. Care transitions between settings are a well-known cause of medical errors. A key component of transition is information exchange, especially in long-term care (LTC). However, LTC is behind other settings in adoption of health information technologies (HIT). In this article, we provide some brief background information about care transitions in LTC and concerns related to technology. We describe a pilot project using HIT and secure messaging in LTC to facilitate electronic information exchange during care transitions. Five LTC facilities were included, all located within Oklahoma and serviced by the same regional health system. The study duration was 20 months. Both inpatient readmission and return emergency department (ED) visit rates were lower than baseline following implementation. We provide discussion of positive outcomes, lessons learned, and limitations. Finally, we offer implications for practice and research for implementation of HIT and information exchange across care settings that may contribute to reduction in readmission rates in acute care and ED settings. A Snapshot of Advance Directives in Long-Term Care: How Often Is “Do Not” Done? S. Perry and C. Lawand. Advance directives allow individuals and their families or legal guardians to communicate preferences for interventions and treatments in the event that these individuals are no longer able to make decisions for themselves. This study examines how often do-not-hospitalize (DNH) and do-not-resuscitate (DNR) directives were recorded for residents in 982 reporting Canadian long-term care facilities between 2009-2010 and 2011-2012 and, to the extent possible, whether these directives were followed in acute care settings. It found that three-quarters of long-term care residents had a directive not to resuscitate and that these directives appeared to be well followed across the continuum; only 1 in 2,500 residents with a DNR received resuscitation in hospital. Fewer residents – 1 in 5 – had a directive not to hospitalize, and about 1 in 14 (7%) of these residents was admitted to hospital. The data are unable to determine whether patients or their families provided consent for these hospitalizations at the time of a decision to transfer. Close to half of hospitalizations among residents with a DNH directive were from potentially preventable causes, such as injuries or infections. Although hospital transfers from long-term care decreased over the study period, hospitalizations could be further reduced with the enhancement of palliative care services in long-term care settings. A. A. Al-Jumaili and W. R. Doucette. OBJECTIVES: The objectives of this review were to identify the work system factors influencing medication safety measures [adverse drug events (ADEs), adverse drug reactions, or medication errors (MEs)], to determine the incidence of ADEs, and describe the most common ADEs in nursing homes (NHs). METHODS: A comprehensive literature review was conducted using PubMed and CINAHL to identify studies investigating factors that influence ADEs, adverse drug reactions, and MEs in NHs and skilled nursing facilities. An initial search identified related studies over 3 decades (1985-2016). Studies were classified according to Systems Engineering Initiative for Patient Safety model factors. RESULTS: Sixty studies were included in this review, which identifies 5 categories of work system factors affecting medication safety in NHs: persons (resident and staff), organization, tools and technology, tasks, and environment. The personal characteristics of NH residents included age, number and types of scheduled medications, and number and types of comorbidities. In addition, inadequate nursing staff medication knowledge and training are usually associated with administration MEs. Organizational factors include interprofessional collaboration, physician and pharmacist accessibility, and staff/resident ratio. A high staff number plays an essential role in preventing MEs and fracture incidents. The technology (barcode medication system) and tools (ME-reporting systems, ADE trigger tool, and potentially inappropriate medication criteria) can enhance the detection of MEs and ADEs. Workload and time pressure negatively impact NH staff task performance. Use of an ADE trigger tool by healthcare providers enhanced the ability to identify ADEs more than 50-fold over 6 months. Several environmental characteristics such as staff distraction and interruption negatively influence medication safety in NHs. The incidence rates of ADEs in NHs ranged from 1.89 to 10.8 per 100 resident-months. The most common ADEs were bleeding, thromboembolic events, hypoglycemia, falls, and constipation. CONCLUSIONS: The Systems Engineering Initiative for Patient Safety model is a useful framework for investigating the factors contributing to ADEs. Multiple work-system factors affect the medication safety of NH residents. A comprehensive study is needed to quantify the influence of various work-system factors on ADEs in NHs. J. van Kooten, M. Smalbrugge, J. C. van der Wouden, M. L. Stek and C. M. Hertogh. OBJECTIVES: To study pain prevalence, pain type, and its pharmacological treatment in Dutch nursing home residents in relation to dementia subtype and dementia severity. DESIGN: Data were collected as part of the PAINdemiA study, an observational cross-sectional study conducted between May 2014 and December 2015. SETTING: Ten nursing homes in the Netherlands. PARTICIPANTS: A total of 199 nursing home residents in various stages of dementia. MEASUREMENTS: We collected data on pain (by observation: MOBID-2 Pain Scale and by self-report scales), pain type, pain medication, dementia subtype, dementia severity (GDS), and demographic features. RESULTS: In the whole sample, the prevalence of pain was 43% (95% confidence interval 36%-50%) using the MOBID-2 Pain Scale. Regardless of regularly scheduled analgesics, approximately one-third of the residents with pain suffered from moderate to severe pain. Pain assessment with the MOBID-2 Pain Scale showed no difference in pain between dementia subtypes, but residents with more severe dementia experienced pain more often than those with less severe dementia (27% vs 15%). The prevalence of self-reported pain was significantly higher in residents with vascular dementia (VaD) (54%) compared with those with Alzheimer disease (18%) and other dementia subtypes (14%). Nociceptive pain was the predominant type of pain (72%) followed by mixed pain (25%). Acetaminophen was the most prescribed analgesic (80%). CONCLUSION: Most of the participating nursing home residents had no pain; however, pain was observed more often in residents with severe dementia, whereas residents in the early stages of VaD self-reported pain more often that those with other dementia subtypes. As one-third of the residents with clinically relevant pain had moderate to severe pain regardless of using pain medication, more focus should be on how pain management could use more tailored approaches and be regularly adjusted to individual needs. M. H. Woolford, C. Weller and J. E. Ibrahim. BACKGROUND: Unexplained absence of nursing home (NH) residents is one of the most challenging issues related to the care of older people. The aim of this review was to examine the death and injury outcomes of unexplained absence of NH residents. METHOD: We searched MEDLINE, CINAHL, EMBASE, PsycINFO, AgeLine, and Cochrane Library to identify qualitative and quantitative studies published in the English language. Data on death and injury were collated, and aggregate proportions were calculated where possible. RESULTS: Nine studies were identified; most (n = 6) were conducted in the United States. Persons with dementia formed the study population in all studies. There were 1440 individual unexplained absences reported across the 9 studies. We calculated a rate of 82 deaths and 61 injuries per 1000 incidents of unexplained absence. Extreme temperatures were the most common cause of death. Most individuals left by foot, and were found within a 1-mile radius of place last seen in green vegetation and waterways. CONCLUSION: This review provides valuable insight into death and injury outcomes. Further studies are recommended to improve understanding and prevent adverse outcomes. Researchers, patients, clinicians, students, policy makers and more will gather to share insights, connect with colleagues and promote patient-oriented research. 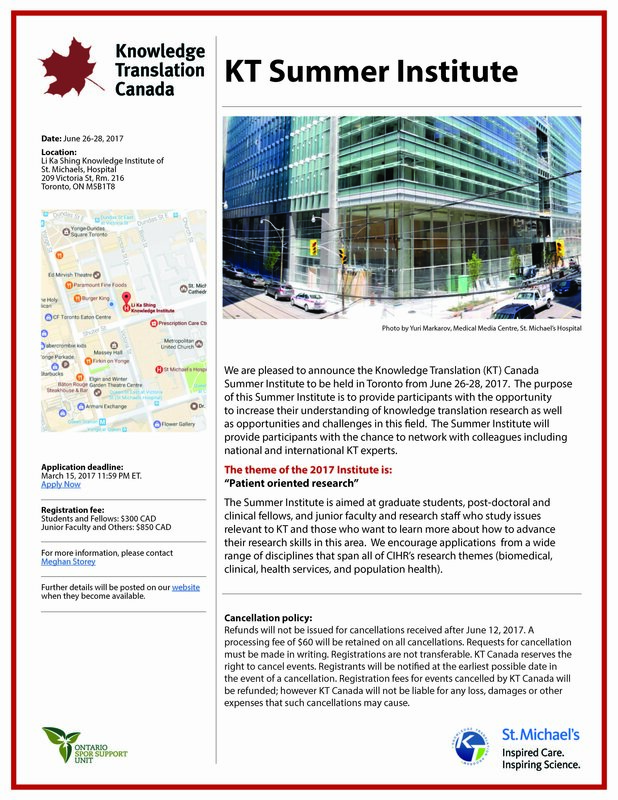 “Summer Institute 2017 is the place to be if you are passionate about patient-oriented research, or you want to learn from experts in the field,” says Dr. Diane Aubin of the AbSPORU Career Development Platform. A highlight of the conference will be keynote speaker Simon Denegri of the National Institute for Health Research and INVOLVE who will share insights and experiences of the UK’s patient-oriented research journey. Anil Arora, Chief Statistician at Statistics Canada, will be available for an informal discussion of Stats Can-related topics. More than a million Canadian seniors are living with frailty: this may double by 2022. What does Canada’s healthcare system need to look like in 2022 to meet this challenge? What evidence is needed? How do we scale best practices nationally? What domestic and international collaboratives could be formed to expedite this? How can we engage our citizens to transform care of older frail Canadians? Contribute to answering these questions and more at the Canadian Frailty Network (CFN) 2017 National Conference: Canada’s pre-eminent conference on frailty. Join April 23-24 in Toronto to hear from, share knowledge, brainstorm and network with leading experts in the field – addressing the full continuum of care, education/training and citizen engagement. In addition to presenting the latest knowledge – looking ahead to the next five years and beyond will be a focal point and recurring theme throughout the conference. CGNA2017 is the 19th Biennial Conference of the Canadian Gerontological Nursing Association, an organization that represents gerontological nurses and promotes gerontological nursing practice across national and international boundaries. With a focus SoAR Logoon aging research, Symposium on Aging Research (SoAR) is a one-day meeting for engaging with graduate student research beyond disciplinary and professional boundaries, and across areas of expertise. The purpose of this Summer Institute is to provide participants with the opportunity to increase their understanding of knowledge translation research as well as opportunities and challenges in this field. The Summer Institute will provide participants with the chance to network with colleagues including national and international KT experts. The field of translational science seeks to close the gap between research knowledge and human application to improve health. Adding an Indigenous lens to this work reveals tensions between colonial structures and translational efforts to further Indigenous health in Canada. B.C.’s seniors advocate is continuing to voice concern about high rates of anti-psychotic drug use among seniors living in care homes. Provincial seniors advocate Isobel Mackenzie commented on the issue following her latest report on almost 300 publicly funded care homes in the province, released at the end of last month. Residents in many of those care homes, including those on the North Shore, had high rates of anti-psychotic drug use even though they had not been diagnosed with psychosis. Growing old can be a lonely process. For some seniors, the deaths of spouses, family members and friends can leave them feeling isolated and depressed. To combat the problem, a national campaign in the U.K. is reaching out to seniors to break the cycle of loneliness, and some smaller groups are experimenting with similar efforts in Canada. Finding out what a good care home looks like can help you to make choices about your care. It can also help you understand what you should be able to expect from a service you already use. The simple truth is that we are living and working longer, which also means that we are redefining the meaning of “later life” and that older people are enriching our communities and society in new and vital ways. But many of us won’t enjoy a gentle retirement. Older adults are arguably the fastest growing subset of what are increasingly called “complex” patients—those with significant health and social needs, often including several chronic health conditions. Figuring out how to provide better care to them—care that works—is both a moral and economic imperative. How to promote better use of patient-reported data for quality improvement? We hosted a 1-day event where attendees could come together to share their patient experience insights and increase their knowledge and skills about approaches and best practices. Canadian Frailty Network receives $23.9 million in renewal funding! Canada’s ability to care for more than 1.2 million frail older citizens along with their families, caregivers and care providers received a significant boost with the announcement of $23.9 million in renewal funding for Canadian Frailty Network from the Government of Canada’s Networks of Centres of Excellence program for a second five-year term (2017-2022). The Centers for Disease Control and Prevention have released new guidelines related to managing influenza outbreaks in long-term care facilities for the 2016-2017 flu season. Influenza is easily introduced into a nursing home by newly admitted residents, health care workers and loved ones who are visiting their relatives. Prevention is important as the transmission of such viruses can make residents severely or fatally ill. Despite portrayals of sexuality in popular media that are tied to youth and beauty, sexual desire does not necessarily fade with age. The need for intimacy and affection is still important to many residents living in long-term care facilities and sexuality is linked to their overall wellbeing and quality of life. However, this topic is a challenging one for many staff and family members, who may have trouble openly discussing the needs of residents in their care. The Agency for Healthcare Research and Quality (AHRQ) created On-Time Pressure Ulcer Healing to help nursing homes with electronic medical records address pressure ulcers that are slow to heal. Pressure ulcers remain a serious problem in nursing homes despite regulatory and market approaches to encourage prevention and treatment. Pressure ulcers cause pain, disfigurement, and increased infection risk and are associated with longer hospital stays and increased morbidity and mortality. Median annual nursing home pressure ulcer prevalence was 7.5 percent in 2009, with associated costs of $3.3 billion annually. Long-term care facilities may be defined as institutions, such as nursing homes and skilled nursing facilities that provide health care to people (including children) who are unable to manage independently in the community. This care may represent custodial or chronic care management or short-term rehabilitative services. Influenza can be introduced into a long-term care facility by newly admitted residents, health care workers and by visitors. Spread of influenza can occur between and among residents, health care providers, and visitors. Residents of long-term care facilities can experience severe and fatal illness during influenza outbreaks. Mandating and funding a standardized data collection solution across Canada to create a baseline from which changes can be made to improve the quality of services in long-term care. In this guide we have used the term “loved one” for simplicity to refer to any family member or partner living in an aged care facility. Taking a head-on approach, husband-and-wife duo Brian M. Cassidy and Melanie Shatzky peer with fly-on-the-wall access into the beige, featureless corridors of a nursing home, presenting an uneasy yet impactful ‘portrait of fading bodies and minds.’ Forgoing conventional documentary modes for a poetic treatment of the aging, the residents here, shot over the course of five years, are captured with a disconcerting deadpan realism. CCID login required to access film. The Canadian Foundation for Healthcare Improvement (CFHI)’s Is Research Working for You: Self-Assessment Tool explores an organization’s capacity to use research evidence, including the availability of evidence, the ability to assess evidence quality and the capability to disseminate evidence for decision making. On 15 October 2016, the McMaster Health Forum convened a citizen panel on enhancing access to patient-centred primary care in Ontario. The purpose of the panel was to guide efforts to enhance access to patient-centred primary care in Ontario. This summary highlights the views and experiences of panel participants about: the underlying problem; three possible elements to address the problem; and potential barriers and facilitators to implement these elements. The post offers considerable scope for a researcher to develop his or her own independent research study (with a strong focus on ‘partnerships’) while also aligning with the wider programme of ‘research on research’ linked to the Oxford BRC. He or she will develop relationships and research collaborations with relevant PHWI sub-themes and (where relevant) with NHS, industry and third-sector partners.